For today's trip I decided to go to Tantan in Tennoji, a sister shop to Senba Tantanmen in Yotsubashi. Just like the former shop, they had a variety of different styles, including a mild white sesame bowl. I had to go with the spicy one, though, so I went with the Taiwan-style red tantanmen. As advertised, the bowl of ramen reminded me more of Taiwanese beef noodle soup than of traditional ramen. 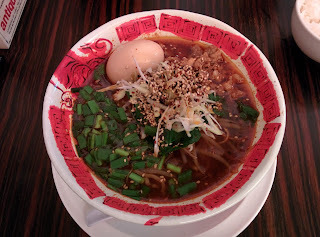 The broth was thin and dark, spicy, and with small pieces of pork and chives floating about. The noodles were short, curly, and chewy, and the miso diced pork was good, but the hard-boiled egg felt a bit out of place. It was good, but I don't think I'll make another stop. If you're looking for some Chinese-style tantanmen, check it out.